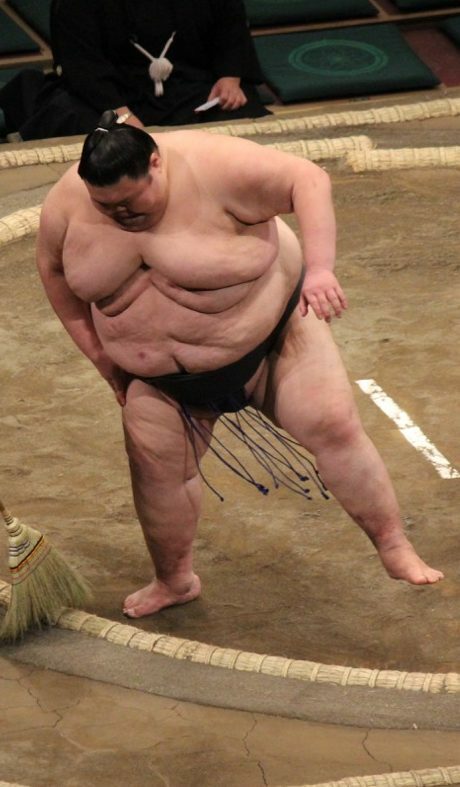 One of the Sumo fighters at the Tokyo Budokan. The tour began on January 7th where the bulk of the group, led by Shihan Rick, departed Sydney for Tokyo. 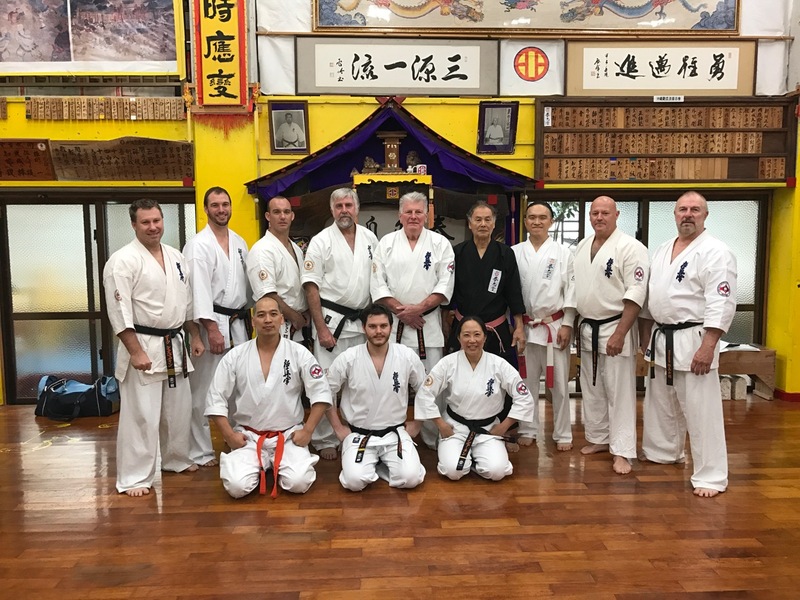 The first component of the tour was a sightseeing trip on the mainland, for which Sensei Mark Shelmerdine, Sensei James and Sensei Jon brought their families along. Sensei Paul and Sempai Trish met up with the rest of the group in Tokyo, as they had been travelling in Japan already. The group threw themselves into the wonders of Japan quickly, spending their time in Tokyo at the Japanese Sword Museum, temple of the 47 Ronin, the fish markets, the Yushukan, the Imperial Palace Gardens, Disneyland and Sumo at the Budokan. Two important Kyokushin sites were also visited during the group’s time in Tokyo: the memorial Shrine for Sosai Mas Oyama at Mt Mitsumine, and Sosai’s grave in Gokokuji. The group continued their travels around the country, staying in Yudanaka, Nagano and Kyoto. Everyone enjoyed staying in the Ryokan hotel in Yudanaka and seeing the snow monkeys. Sensei Paul, Sensei James and Sensei Jon also went skiing, where Sensei James really shined! The group met with Shihan Howard and his wife Masumi in Kyoto on January 16th – bringing the whole group to a total of 19 people. 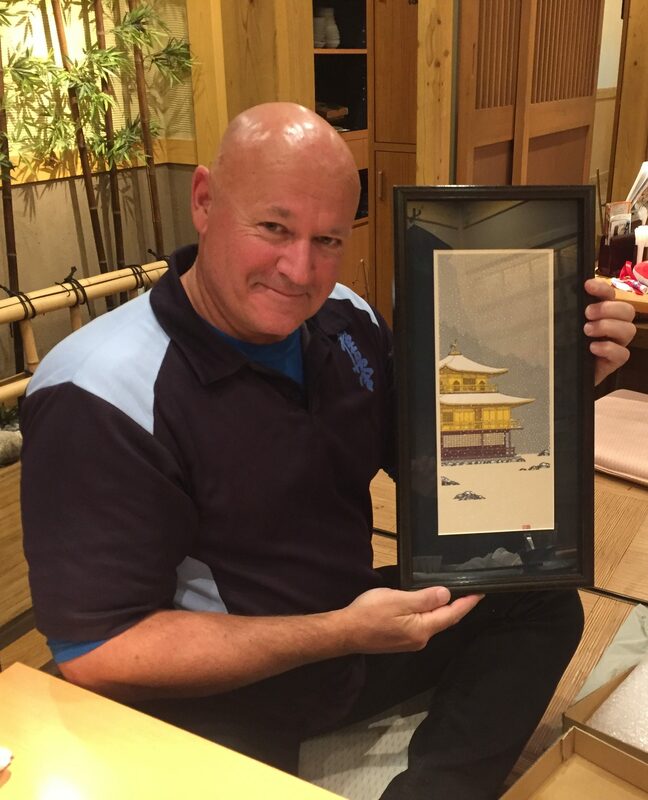 Shihan Rick receives his thank-you gift for leading the sightseeing part of the tour. On January 19th, the karate members of the tour group set off for Okinawa. The families returned to Australia while Masumi remained in Kyoto to spend time with her mother. 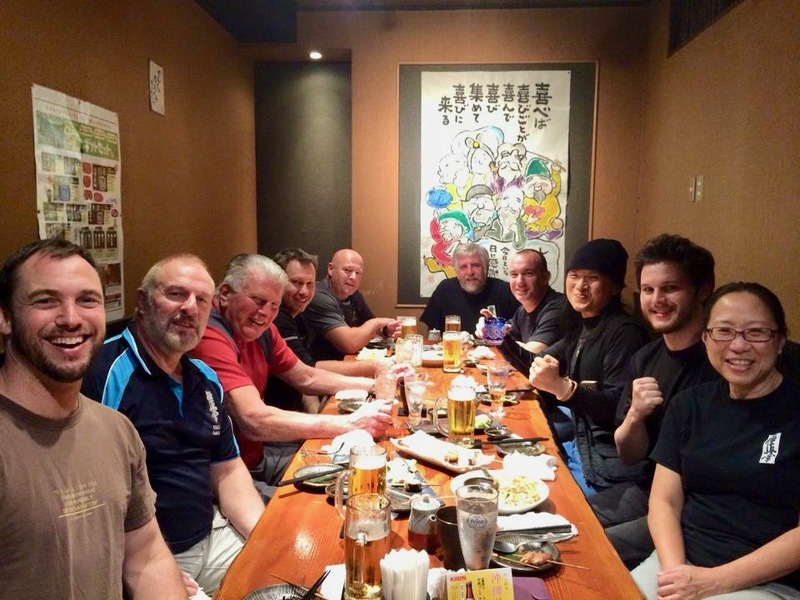 The tour group had dinner that night with Sensei Tetsuhiro Hokama (10th Dan) and Shihan Ken Ogura (8th Dan). Shihan Howard met Sensei Hokama in January 2008 and KIMAA has enjoyed a long friendship with Sensei since then. 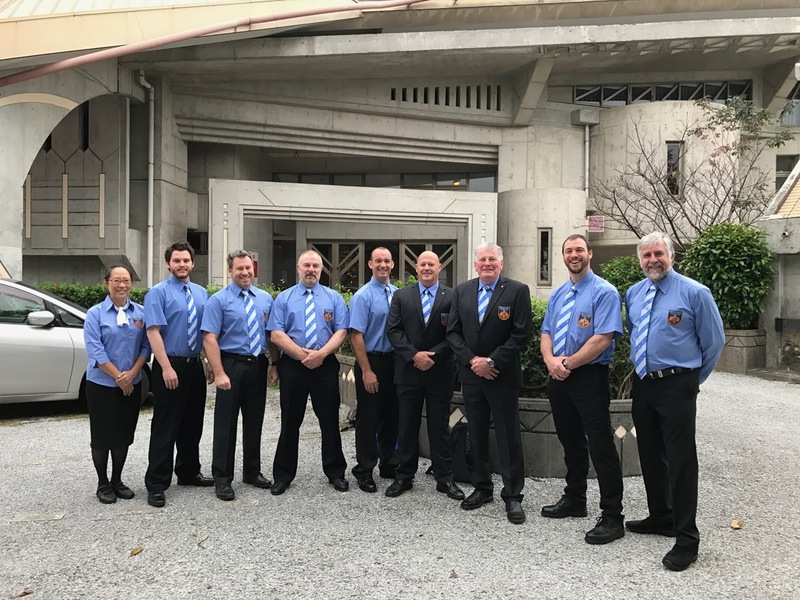 Members of KIMAA, particularly Shihan Howard and Shihan Rick, have travelled yearly to Okinawa for training since 2008 – and often multiple times a year. KIMAA last trained with Sensei Hokama in the 2015 Japan Group Tour. During this trip, KIMAA first met Shihan Ken and enjoyed hosting him in October 2016 for a week-long seminar. The next two days comprised training at Sensei’s dojo with Sensei Hokama and Shihan Ken. The focus was on pressure points, breaks, takedowns, self-defence, kata bunkai and Kobudo. There was lots of partner work involved, and Sensei Jon Ellis performed a board break (tameshiwari) as a part of training. The Kobudo team performed a Jo kata to Sensei Hokama. Sempai Alex demonstrated bunkai for the kata. The standard of the group’s kata and bunkai greatly impressed Sensei Hokama. Sensei and Shihan Ken then ran the team through other possible defence manoeuvres with a Jo. On Friday the 20th, Sensei Jon Ellis was graded to 3rd Dan in Kobudo and Sempai Alex Lloyd was graded to 2nd Dan in Kobudo. Congratulations Sensei Jon and Sempai Alex! Tony Kuo, a student from Turramurra Dojo, joined the tour briefly at the invitation of Shihan Howard. He participated in all the training at Sensei Hokama’s dojo. KIMAA with Sensei Hokama and Shihan Ken after training: Sensei Mark Shelmerdine, Sensei James Sidwell, Sensei Jon Ellis, Sensei Mark McFadden, Shihan Howard Lipman, Sensei Tetsuhiro Hokama, Shihan Ken Ogura, Shihan Rick Cunningham, Sensei Paul Finnerty, Tony Kuo, Sempai Alex Lloyd & Sempai Patricia Tan. The final event attended by the tour group was the Kyokushin Union’s 4th World Tournament. Fighters from all around the globe were competing, including from Australia. KIMAA caught up with Shihan Trevor Field (7th Dan) from Brisbane, who was the tournament’s Chief Arbiter. The tournament was hosted by Shihan Yasuhiro Shichinohe (7th Dan). KIMAA members trained with Shihan Shichinohe in the 2013 tour, and Sensei Don Cheong and Sempai James Campbell fought in his 2015 Okinawa tournament. KIMAA at the Kyokushin World Tournament. Shihan Howard and Sensei Hokama were invited by Shihan Shichinohe to sit at the official table. The rest of the group, along with Shihan Ken, enjoyed front row seats. The tournament was two full days, primarily focused on full contact knockdown fights. There were three divisions: Men’s Open, Women’s Open and Women’s Lightweight. Some demonstrations were also made, including Shihan Shichinohe performing an ice break. KIMAA with Shihan Ken at dinner on their last night of the tour. The tour group flew back to Australia after the weekend, arriving home on the morning of Tuesday January 24th. The KIMAA Japan Group Tour was a fantastic success. The sightseeing was enjoyed by all, the World Tournament was a fantastic spectacle, and the opportunity to once again train with such knowledgeable and skilled martial artists as Sensei Hokama and Shihan Ken was special as always. Thanks go to Shihan Howard and Shihan Rick for organising and leading the tour.